This is a great multi grain pancake recipe based on Crescent Dragonwagon’s Multigrain Pancakes in The Cornbread Gospels. I substituted barley for the buckwheat used in Crescent’s recipe because I was inspired by the new share. 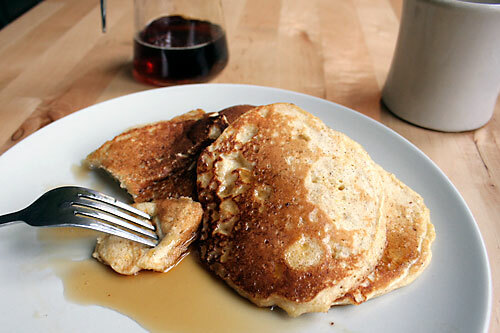 The Nothstine is so sweet and light that it adds wonderful flavor and texture to the pancakes. I’m also looking forward to trying the colorful Mandan and Plymouth varieties. That’s the beauty of this recipe. It’s a great base from which you can use endless combinations of grains. Have fun! 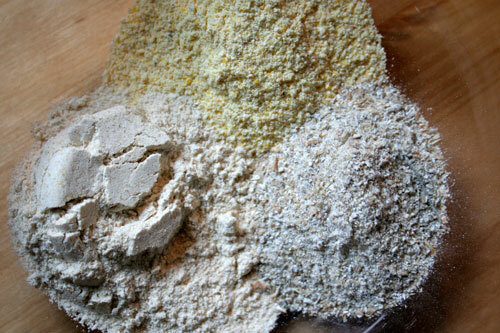 Combine all the dry ingredients in a large bowl. Melt the butter in the large skillet or griddle you’ll be using to cook the pancakes. Beat the eggs in a medium sized bowl, then pour in the melted butter from the pan, add buttermilk and mix well. While stirring, add the wet mixture to the dry. Don’t over mix. Cook the pancakes over medium heat. 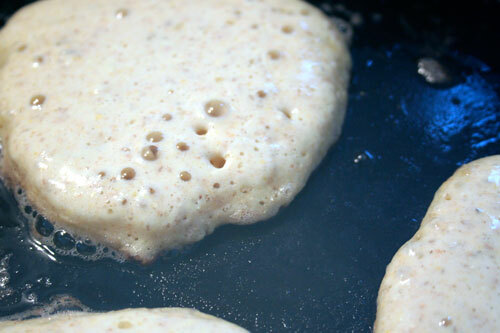 Flip the pancakes as soon as bubbles form and remain around the edges of the pancakes. Serve immediately. We have a rule in our house that says, for pancakes, you don’t have to wait for everyone to be served before you start eating! These are best right off the grill.